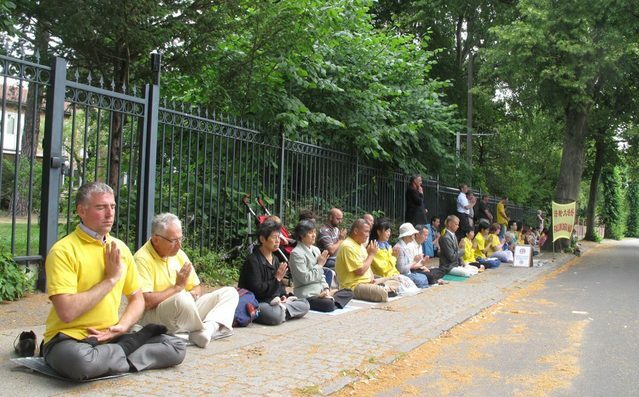 Thousands of Falun Gong practitioners from across Europe gathered in Copenhagen, Denmark on July 20, 2013, to attend the 2013 European Falun Dafa Cultivation Experience Sharing Conference. They also took part in a parade, rally, and candlelight vigil. Practitioners came from a variety of countries, spoke different languages, and were of different ages. Yet they all came together for the same reason, to attend the Faconference and to call on the world's people to help stop the Chinese Communist Party’s (CCP) persecution of Falun Gong. 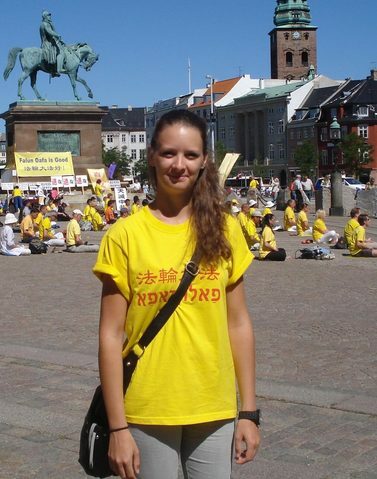 Joanna, a practitioner from Greece, has been practising Falun Gong for three years. She said that she came to Denmark not only for the experience sharing conference, but also to clarify the facts about Falun Gong to the Danish people, which she thought was very important. Six Latvian practitioners arrived in Copenhagen on July 19. As soon as they stepped off the plane, they went straight to the Chinese embassy to join the peaceful protest in front of the embassy. The day before they arrived in Denmark, the practitioners participated in a rally in front of the Chinese embassy in Riga, the capital of Latvia. They clarified the facts to the tourists and locals, exposed the Chinese regime's 14 year-long persecution of Falun Gong, and called on people to help stop the persecution in China, especially the organ harvesting from living Falun Gong practitioners. Local media reported on their activities and conducted numerous interviews. Lauris, another practitioner from Latvia, said that Latvian practitioners came to Copenhagen and participated in the event to let more people know about Falun Gong, and to call for an end to the persecution. Lauris noted that Latvia was formerly a communist country, and that people know first-hand about the evils of communism. Through the efforts of many Falun Gong practitioners, people can now find a copy of the book, Nine Commentaries on the Communist Party in local libraries and bookstores. Two Vietnamese practitioners who live in the Czech Republic took their wives and children to attend the 2013 European Falun Dafa Cultivation Experience Sharing Conference. “Two years ago we were fortunate enough to encounter Dafa,” said one of the practitioners. Although they haven't been cultivating for very long, they are diligently fulfilling their mission to clarify the facts and call for an end to the persecution. 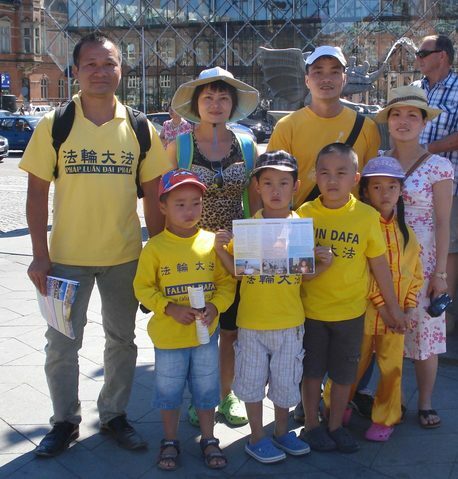 The two families participated in the Falun Gong parade on July 20 in Copenhagen, and distributed informational fliers in the Town Hall square. 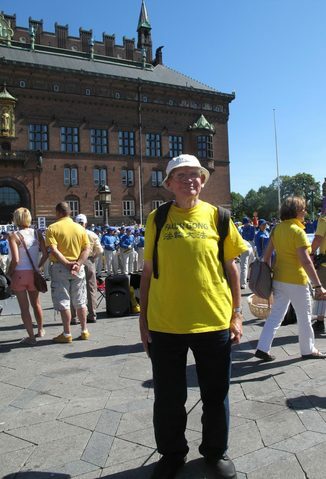 Mr. Poul Andersen, an 85 year-old Dane, has been peacefully protesting in front of the Chinese embassy in Copenhagen for many years. He bicycles to the Chinese embassy every day, helps set up the informational displayed boards, then meditates for an hour. “Our peaceful protest in front of the Chinese embassy in Copenhagen started in 2002,” he said. “For me this is the most worthwhile thing I can do. Since I came into this world, nothing has worked out for me. I felt that everything was wrong, until I luckily encountered Falun Dafa. I now feel that my life has real meaning. Falun Dafa is everything to me! “Some passersby smiled at me, some even said hello. I offered them fliers; some took them, some didn't. I've been doing this for eleven consecutive years, except for a few occasions when I wasn’t feeling very well. Mr. Andersen said that he was very happy to see so many European practitioners in Copenhagen. You could clearly see his youthful exuberance and dedication during the Falun Gong parade and rally.